Right on schedule, one of the two processors set to be used inside the highly anticipated Galaxy S10 has been unveiled... with surprisingly little fanfare. Of course, Samsung had much bigger fish to fry recently, embracing the notch and teasing its bold vision for the foldable future of the mobile industry. 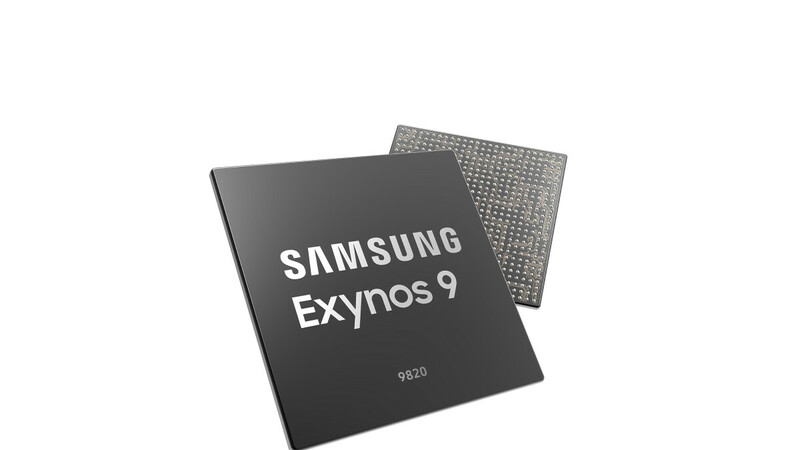 Still, the newly announced Exynos 9820 (or Exynos 9 Series 9820) chipset is a pretty big deal too, performing “AI-related functions seven times faster than its predecessor.” The Exynos 9810 powering international Galaxy S9, S9+, and Note 9 versions was obviously no slouch, but the 9820’s biggest improvement is undoubtedly the inclusion of a dedicated NPU (Neural Processing Unit). That should bring Samsung’s latest flagship SoC on par with the Apple A12 Bionic and Huawei’s Kirin 980 powerhouse, at least as far as theoretical AI tasks are concerned. Unfortunately, while the competition has already moved to a 7-nanometer architecture, the Exynos 9820 upgrades its forerunner’s 10 nm node to an intermediary 8 nm LPP (Low Power Plus) FinFET production process. That means this may not be the world’s most energy-efficient silicon, even though Samsung did recently kick off 7 nm EUV (Extreme Ultraviolet Lithography) chip manufacturing. We’re guessing the technology is simply not ready for primetime yet, but perhaps there’s a separate Exynos SoC in the pipeline for that rumored 5G-enabled Galaxy S10 variant. That’s right, the 9820 still integrates a good old fashioned LTE modem (an LTE-Advanced Pro with LTE Category 20 support, to be exact), while the CPU architecture has been revised to include three clusters instead of two. At the end of the day, what’s important to keep in mind is that multi-core and single-core performance are improved by 15 percent and “up to” 20 percent respectively compared to the Exynos 9810, while power efficiency gets a massive boost of “up to” 40 percent... on paper. The new Mali-G76 MP12 GPU should also bring substantial upgrades to the table compared to last year’s G72 MP18, aiming for “more impressive, uninterrupted gameplay.” We’re talking cool 40 percent performance enhancements and around 35 percent improved power efficiency. Last but not least, we should probably mention the Exynos 9820 supports up to five camera sensors and 8K video recording, although that’s not necessarily what the Galaxy S10 will offer in terms of imaging prowess. But it does make us dream of a Galaxy Note 10 with five shooters in tow. This is probably the most disappointing Exynos yet. They used a less wide GPU (MP12 vs MP18 last year), old cortex A75 cores when Huawei is(already) deploying A76 cores, is still 4G only, and using an inferior process node (Samsung 7nm EUV > TSMC 7nm >>> Samsung 8nm FinFet > 10nm). This, coupled with poor kernel optimization from Samsung(evident in 8895 and 9810) is a recipe for disaster. I'm glad this chip is only used in Samsung phones, since the 855 would be a significantly better chip. I do hope for a better chip from Samsung next year, and hopefully we go back to the days of the 7420 and 8890 when Exynos used to be the better chip. Agreed, though Samsung's 7420 was superior only because Qualcomm screwed up big time with the 810...but A9 was the fastest chip then. So as per usual, the Galaxy rumors always starts off with some exciting,unheard of rumors months away, then as announcement draws closer, the reality starts to be painfully ordinary. Even the design that a big deal has been made of will seemingly have a freaking display hole, might ditch the HP jack, the SoC is 8nm, no dual npu, as per rumors the battery would be nothing revolutionary, would most probably not beat the pixel and Huawei in the camera department. Honestly, I won't be surprised if Huawei p30 wipes the floor with the so much hyped anniversary model next year. Most of the time these manufacturers forget that the rivals wouldn't just sit down and fold their arms. Even as it stands now, the mate 20 pro will be ahead of the gs10 in some ways.. how much more the p30. Your and Boast_Rider attempts to catastrophize the launch of the new 9820 seem weird. For example the Cortex A75 is smaller and slightly more efficient than the A76. If you look at the Kirin 980 the second set of A76 cores are clocked below 2ghz. So I don't see how choosing the A75 design for the lower power big cores is mistake. The lower clocked A76 core in the Kiring 980 and the upcoming Qualcomm SOCs most likely won't be faster or more efficient anyway. For the GPU Samsung quoted a 40 percent performance improvement and around 35 percent improved power efficiency. How is that a bad thing? Because they didn't use a wider GPU that would have consumed more power and would have throttled faster? You have any proof of the claim that A75 is more efficient iso-performance? I highly doubt that. Wider GPU doesn't consume more power. An MP10 configuration on 400 MHz will be just as fast as MP5 on 800 MHz, but since power scales with V^2*f and 400MHz will require about 60-70% of the voltage, the MP10 will be much more efficient. Wider configuration is ALWAYS more efficient iso-performance, it just costs more money. I guess it all stems for the process fail Samsung had. Samsung 7nm EUV is the process this chip should be made at, but it's probably not ready in time. Samsung 8nm is just a revision of its 10nm, and they had to resort to it, which caused less chip area available for wider designs and hence the poor cpu and GPU choice. A doubly wide configuration actually consumes less than half the power at half frequency (with same performance). That's why mobile chips had 8 cores way before desktop ones, or why mobile chips work at ~2 GHz. In fact, on my OnePlus 6 I was able to reduce the CPU power consumption by about 60% by under locking it 30%(2.8 to 2 GHz). Sure I can. A quote from Anandtech. "In broad metrics, what we’re promised in actual products using the A76 is the follows: a 35% performance increase alongside 40% improved power efficiency. These figures are baselined on A75 configurations running at 2.8GHz on 10nm processes while the A76 is projected by Arm to come in at 3GHz on 7nm TSMC based products." Samsung didn't use 10nm on the 9820 and their 8nm does provide around 35% power improvements(Samsung actually says the 9820 is up to 40% more efficient). So an A75 core on a 35% more efficient node is more efficient than the A76 core running at 3ghz on a 7nm node. Simple. OK so you say that a bigger GPU running at a lower clock would provide the same performance at slightly better efficiency(because that's there truth, there is no way efficiency would be "much better"). You ignore the fact that the bigger GPU also means more transistors and well a more expensive SOC. So basically Samsung made a decision to maximize cost/performance and efficiency when they designed the 9820 and you say that's bad. Now that's funny. And I don't see how the 9820 is a failed 7nm EUV project Samsung had to port on their 8nm. They certainly didn't make a new node in the last minute and the 9820 was most likely designed with their 8nm in mind. The 9820 isn't purely A75, it also uses mongoose, so your comparison is not valid. And I said in my post that a wider GPU does cost more. They couldn't do that wide GPU since they couldn't get the 7nm in time. If they did, they would be able to fit everything in the power/area budget. Any way you slice it, this chip is going to have a VERY hard time competing with devices on a better manufacturing node. Apple, Qualcomm or even Huawei have a huge headstart. Just because the A75 is higher clocked doesn't mean it's more efficient, since the A76 is a wider design and has more IPC. Anyway, let's just agree to disagree here, since we will never know which one is more efficient. About the Samsung 8nm vs TSMC 7nm, here are some numbers that should put that to rest: Samsung 10 nm: 42nm x 68 nm (fin pitch x gate pitch) TSMC 10 nm: 44nm x 66nm Samsung 8nm: 42nm x 64 nm (almost the same as 10nm) TSMC 7nm: 40nm x 54 nm (gate pitch significantly smaller) Samsung 7nm EUV: 27nm x 54nm (the golden goose) Samsung 7nm is going to be the holy grail of density, but unfortunately it's a bit delayed. My estimation is that we will see it in the next iPhone the first time. But Samsung's 8nm is NOT comparable to TSMC's 7nm. Higher clocked means nothing. efficiency is measured by performance/watt. Even after clocking a bit higher in the same wattage, A75 will have lower overall performance due to low IPC than A76. So yeah, you're wrong on this. At same wattage, performance will be higher for A76 since performance is freq*IPC, and not just frequency. Anyway, let's just agree to disagree here. The power/performance characteristics we won't be able to compare, but here is a statement from Anandtech yesterday: "The Kirin 980 is 8-15% faster than the 9810 while using half the energy. I'll have the review on this up soon enough. Samsung's 20% improvement *or* 40% efficiency gain claims are simply not enough." Yeah, it's not going to compete anytime soon. What is TSMC's 7nm EUV fin and gate pitch? I don't think that's finalized. You see, Samsung ditched 7nm to go directly to EUV. TSMC on the other hand is working with finfet as a stop gap. So while Samsung is behind now, TSMC is going to be behind next year and that's why Apple's contract should go to Samsung. Right, lower core number doesn't always lower performance, since fewer core count mean higher clock on each core. And don't forget that Exynos 8895 (S8,S8+, and note8) use G71-MP20. It's not the first time they lower GPU core count. G76 actually is doubly-packed g72. But still, 12 core design is a bit low. I was expecting something like MP16, but I guess that's only possible with 7nm. Geekbench is useless. Even the 9810 scores so high in geekbench, but fails in real life with throttling and poor kernel side code. If they can boost the CPU to top clocks quick and sustain that performance, great. But without a die shrink this time (8nm is just refined 10nm) that seems unlikely. 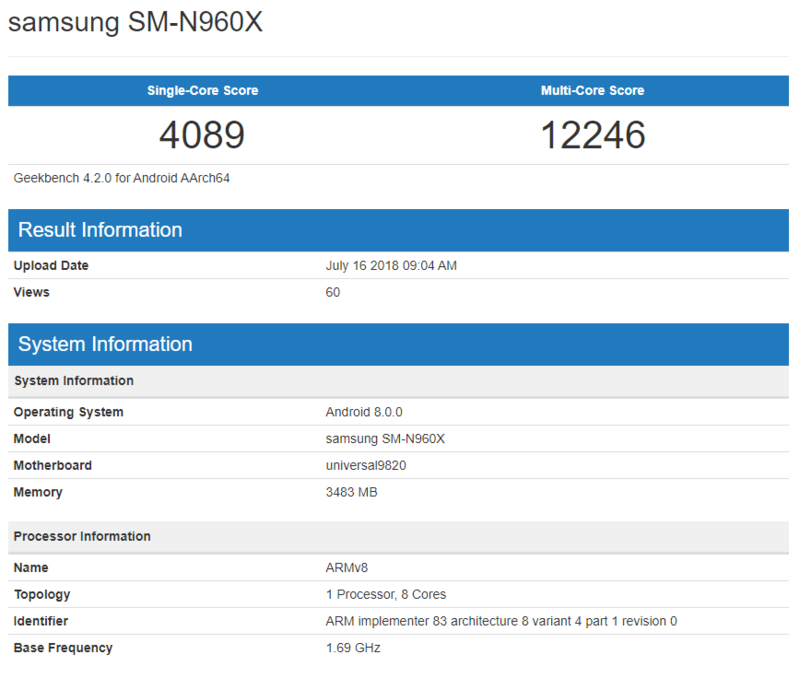 How geekbench is useless since it reflect the real Soc performance?!. I’m using S9 plus Exyonse 9810 since 8 month now and I don’t have any problem with battery or throttling issue that shows on snapdragon 845 on one plus 6 and 6T even google underclocked there pixel 3/3xl snapdragon 845. Sure lol. Everyone online including Anandtech is idiot and your anecdotal evidence should supercede them. https://youtu.be/rZ-mxershFE Ok what about this comparison? !